Grab the family, your group of friends, or colleagues and experience the city in a new way aboard a Spirit Lunch Cruise! Enjoy delicious food, fun deck games, a narrated tour, and unbeatable skyline views from Spirit’s rooftop lounge. 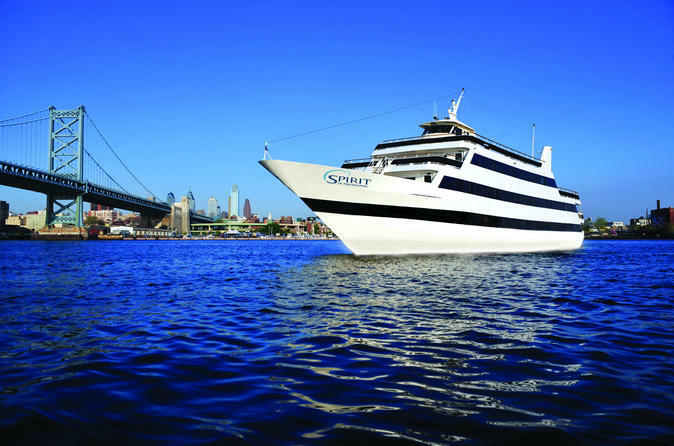 This is an amazing way to experience Philadelphia's waterfront! Grab the family, your group of friends, or colleagues and experience the city in a new way aboard a Spirit Lunch Cruise! Enjoy delicious food, fun deck games, a narrated tour, and unbeatable skyline views from Spirit’s rooftop lounge. After you cast off, relax as you begin your two fun-filled hours on Philadelphia's harbor. Your waiter will invite you to the lunch buffet, where you can sample a little bit of everything or just select your favorite fare. The cuisine is freshly prepared in the shipboard galley and served as an elegant cruise buffet. Savor your culinary selections with music and a never ending view of the city's breathtaking skyline through the panoramic windows.